Who's to blame for the long airport security lines? Security lines at airports across the country are a mess. They're wrapping around terminals, backing-up to two-hour wait times and causing thousands of fliers to miss their flights. And we haven't even reached peak travel season yet. Chicago's airports have warned fliers to arrive three hours ahead of their departure time, and some passengers have stood in lines longer than their actual flight time. Thousands of travelers have missed their flights over the past several months. As passenger count has increased over the years, TSA's manpower has dwindled. In 2013, the agency, which is part of Homeland Security, said it had around 47,000 screeners to handle 643 million passengers. This year, it has 42,525 agents to screen an estimated 740 million travelers. That's a nearly 10% drop in staff to handle 15% more passengers. The TSA recently announced it will hire 768 new officers by mid-June and increase overtime and part-time hours. But that might not be enough. Related: TSA turmoil: Why the long lines? The union that represents TSA workers claims it will take 6,000 new full-time screeners to help ease checkpoint lines. Security checkpoint lanes are often closed because of staffing shortages, according to Hydrick Thomas, a TSA worker at New York's JFK airport and TSA Council president for the American Federation of Government Employees. He said the JetBlue (JBLU) terminal at JFK has 21 security lanes, but only enough agents to have seven lanes open. "All these big airports, you never see all the lanes open," he said. He added that some workers are being forced to skip their breaks because of the long lines. The TSA also ended a screening policy last fall that allowed agents to filter selected passengers into the TSA PreCheck line that helped control the lines. 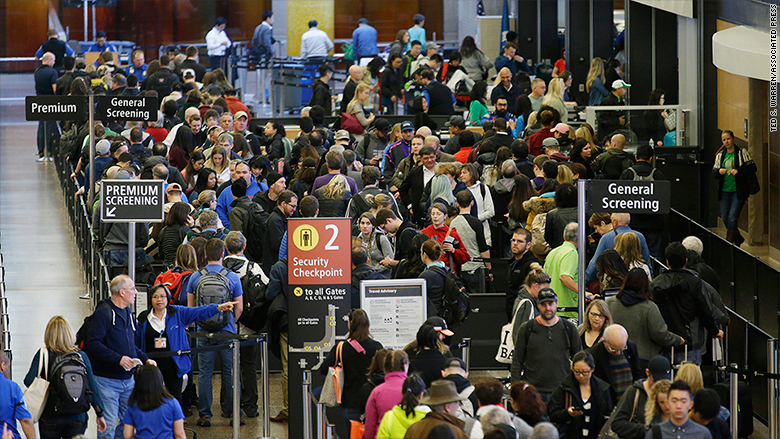 The long lines have pushed major airports to threaten to hire private security workers. @DallasLoveField what's the deal with security wrapping around the airport TWICE?! There are a lot of unhappy customers in line with me. The TSA has also tends to lag when it comes to the use of technology and big data analytics to coordinate staffing levels and scheduling, noted Samuel Engel, head of the aviation group at ‎ICF International. "The TSA is not on the forefront of that kind of advanced planning and they are probably using models a little more reactive rather than predicative." Airlines have been expanding and adding new routes. While that's good news for fliers in the form of more flying options and lower ticket prices, the increased traffic is creating bottlenecks at airports. "There are hundreds of flights leaving minutes behind each other. That is creating a problem for us," said Thomas. "There are not enough employees to accommodate all those flights." But airlines publish their flight schedules nearly a year in advance, according to Jean Medina, a spokesperson for Airlines for America, an airline industry group, so the TSA shouldn't be surprised by the increased passenger volume. Airlines have also tried to help by allocating workers to the security lines to help prepare passengers for screening. Engel also noted that the airlines' checked-baggage fees have increased the number of carry-on bags going through security, which can slow down the screening process. Earlier this month, two U.S. senators sent a letter to a dozen airlines requesting they temporarily suspend the fees in an effort to reduce the congestion. Some airports are are not equipped to handle the flood of travelers now moving through them. "The number of passengers is growing faster than the infrastructure on the ground," said Engel. For instance, at Orlando International Airport, 40 million passengers are moving through a terminal built to handle 24 million. The airport is currently undergoing a $3 billion multi-year expansion project. San Diego International Airport, which is expecting a nearly 6% increase in travelers in July and August, is building more parking since it's current parking lot is frequently 105% full -- with 5% of cars parked illegally. At Hartsfield-Jackson Atlanta International, which experienced a record 101 million passengers in 2015, temporarily closed a four-lane security check point recently for a technology upgrade. TSA workers were shifted to the other checkpoints. Yes, even travelers can play a role in the nightmare delays. The summer months bring out "leisure travelers" -- non-frequent fliers that aren't always familiar with the screening process and can slow down the lines if they're not prepared. People who don't move out of the way once they're through security often lead to bottlenecks, too. To help keep lines moving, passengers should remove their shoes and jackets before getting to the front of the line, and wear shoes that are easy to take off.